A visit to Baltimore’s Station North Arts & Entertainment District on a random Friday night would seem to bear out this promise. Within the space of a few blocks, one can listen to a hip-hop duo perform at Joe Squared, catch a play at Single Carrot Theatre, attend a reading at Cyclops Books, or experience a Baltimore Rock Opera Society show at the newly restored Autograph Playhouse. These are but a few indicators of Baltimore’s surging arts scene, which has led some to claim that the city is in the midst of a cultural renaissance. Yet underlying these signs of vibrancy are some disquieting economic figures. Timberg cites data from the National Endowment for the Arts and the Bureau of Labor Statistics that reveal falling revenues and job opportunities for performing arts companies, musical groups, and individual artists, as well as architects, graphic designers, and photographers. Even as the U.S. begins to emerge from economic recession, the labor market prospects for artists and other creatives remain grim. in the city’s cultural landscape. Official arts districts like Station North, Highlandtown, and the soon-to-be-designated Westside/downtown arts district represent one strategy for creating jobs, providing artist housing, and increasing the city’s cultural vibrancy. These are promising initiatives that should be sustained and expanded. Creators and consumers of the arts can also play a vital role by working with groups like Maryland Citizens for the Arts to advocate for increased public funding for artists, arts, organizations, and cultural activities. At the Art + Justice Project, we believe that arts can be a tool for positive social change. In order to help bring that change about, we need ensure that artists have the resources to produce their work and contribute to the common good. BCF Community Arts Grants Available! The Baltimore Community Foundation (BCF) believes the arts are a critical component of vibrant neighborhoods and a vibrant city, and therefore intends to make grants to programs that engage neighborhood residents in making art that benefits their communities; and forge partnerships among established arts institutions, community-based arts organizations, grassroots artists, and local neighborhoods. BCF’s Neighborhood Grants Program provides Community Arts Grants of up to $7,500 to support projects conducted in partnership by neighborhood groups, local artists, and arts organizations to increase neighborhood vibrancy. Applications for this first round of 2012 Community Arts Funding are due May 15, 2012. A second round of applications will be considered later in the year. Download the application in MS Word format. A new report from the National Endowment for the Arts examines academic and civic-behavior outcomes of teenagers and young adults who have engaged deeply with the arts in or out of school. The report finds that teenagers and young adults of low socioeconomic status (SES) who have a history of in-depth arts involvement show better academic outcomes than do low-SES youth with less arts involvement. Students involved in the arts earn better grades and demonstrate higher rates of college enrollment and attainment. Young adults with intensive arts experiences in high school were more likely to show civic-minded behavior than young adults without, with comparatively high levels of volunteering, voting, and engagement with local or school politics. 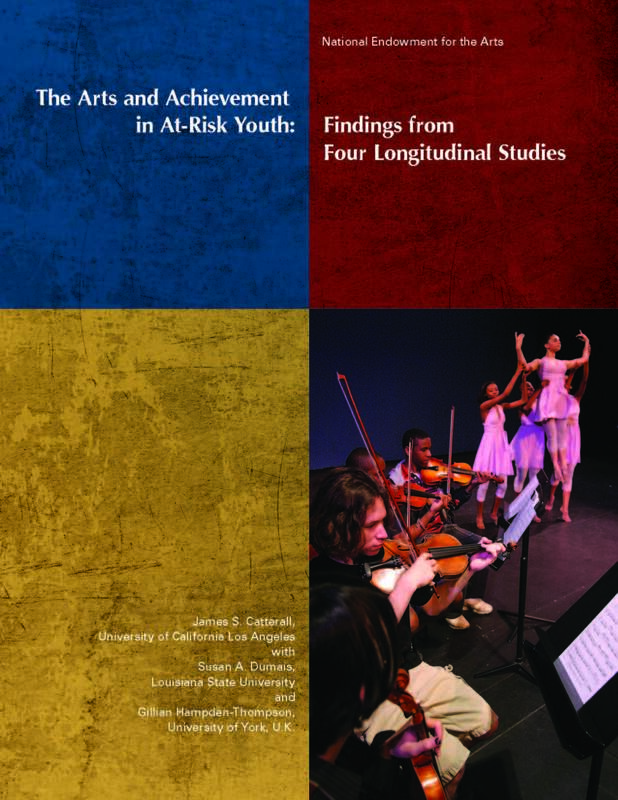 The report concludes that at-risk teenagers or young adults with a history of intensive arts experiences show achievement levels closer to, and in some cases exceeding, the levels shown by the general population studied. This is great news that should inform education policy. That being said, why are the arts always the first to be cut from a school’s budget? What can we do to make the case for arts education? Weigh in with your thoughts.